While my personal ancestry does not have anyone who immigrated later than the 1700s, I have long been intrigued by the experiences of those who came in the latter 1800s and the early 1900s, such a time of concern about the influx of immigrants and what they might do to the country. Over the years I have acquired many published volumes and hundreds of digitized documents about immigrants and the immigration process. I am the only person I know who actually owns E. P. Hutchinson’s Legislative History of American Immigration Policy, 1798-1965, published in 1981. Among the many laws that have been enacted since the first major immigration act in 1882 is the Alien Contract Labor Law of 1885, which was amended in 1887. This law specified that immigrants to the United States needed to show that they were capable of working, but they could not already have a job lined up. Some immigrants were exempt from this rule, including actors, artists, singers, domestic or personal servants, and skilled laborers—provided that no one else with their skills lived in the United States. In Massachusetts, for instance, mills could import seamstresses who did intricate and specialized embroidery because they could not find anyone in the United States who possessed that skill. In viewing case files of individuals deported upon arrival or later, I have come across many that invoked this law. Now, when I am not researching family trees, it is likely that I am at a hockey rink watching a game, or somewhere reading or writing about hockey, embracing my other passion. While hockey has been popular in Canada since the late 1800s, it was not until the 1900s that the sport began to gather a following in the United States. And while kids may have been playing hockey, there was no U.S. citizen skilled enough to play at the professional level when the first teams were being built in Boston, Chicago, Detroit, New York, and other cities. Thus the owners of these teams could import players under the unique-skills exemption. I wondered what type of paper trail a hockey team might generate in getting permission to import their players. 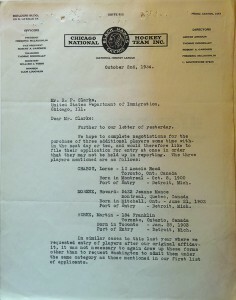 So while in Washington, D.C., at the National Archives a few years back, I turned to the U.S. Subject Index to Correspondence and Case Files of the Immigration and Naturalization Service, 1903-1959, which had subjects dealing not only with hockey players but with stick makers and more. 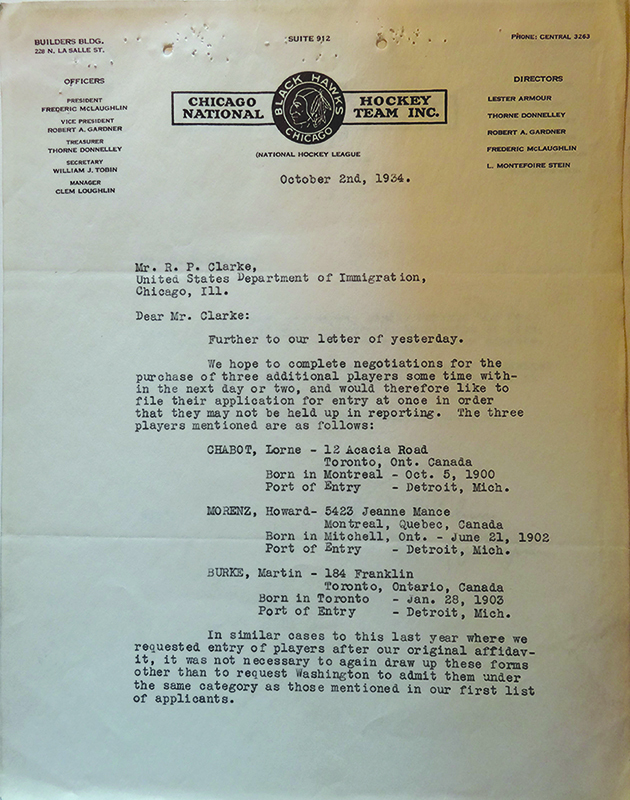 I requested some files, which showed that the teams would send a list of the players they wished to import, indicate how long they would be in the United States, and supply a bond for the players (to ensure they would leave). In some instances, there was further correspondence, for example, following up on whether the players did leave when the season was over. The immigration enthusiast in me loved seeing this process play out in the context of my other passion. The hockey enthusiast in me loved seeing photographs and signatures of some of the earliest players—many of whom went on to have illustrious careers and be inducted into the Hockey Hall of Fame. *The letter was found in Case File No. 55732/311 of RG 85 Records of the Immigration and Naturalization Service, Entry Subject and Policy Files, 1893-1957. Rhonda! Very cool find. As a hockey player, you know, This is awesome!!! Vita Bravis has become very important in my research. I have learned so much since subscribing and reading the comments as well.